Commercial | Frye Roofing, Inc. The roofing system on your business or commercial property plays a critical role in protecting the building, its contents and its occupants from the weather. 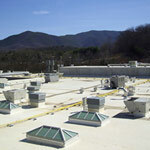 Frye Roofing is experienced with all types of commercial roofing and structures. Among the top 4% of contractors in the country, Frye Roofing is an award winning contractor who has installed over 746 “Perfect 10” installations and is the only roofer in the area to accept a 500 tier Hall of Fame recognition with Carlisle Syntec. If your business needs their roof repaired, replaced or installed, we are the roofing company to call. Own Multiple Properties? Frye Roofing has a team specifically dedicated to serving Property Management Companies and Multiple-Property Owners. We make your projects our top priority and provide unequaled service no matter how large, small or urgent the job is.